These beautiful flowers were 1 of 7 sets of 3 each images. On 1 sheet is printed "Creation of Avec B. V. Waalwijk Holland" and on another "copyright Pigo productions the netherlands". 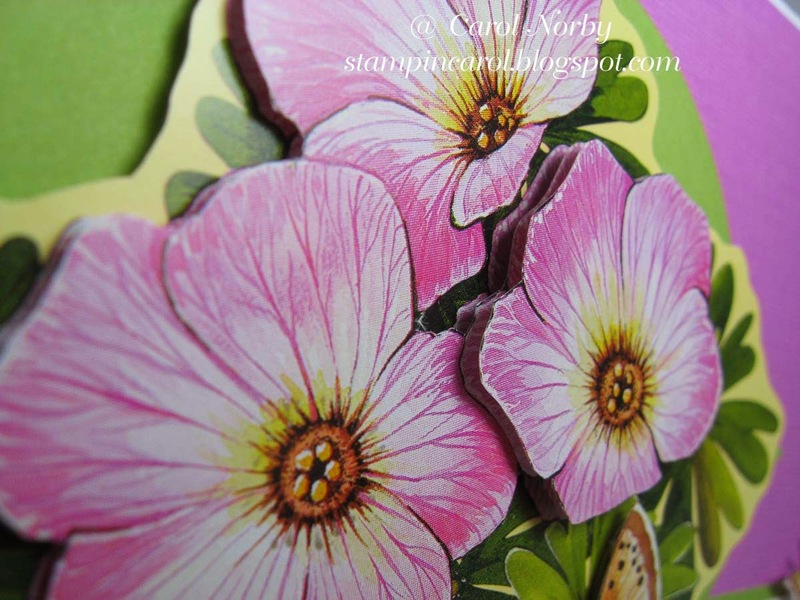 I decided to use a purple layer on the card base to match the purple in the flowers and a green die cut layer to coordinate with the leaves. There was another sheet that showed how to cut out each of the 3 images. This was the easiest image to play with and you can just make out the 2 cut layers over the uncut base. The butterfly is only 2 layers, 1 base and the left set of wings and body. 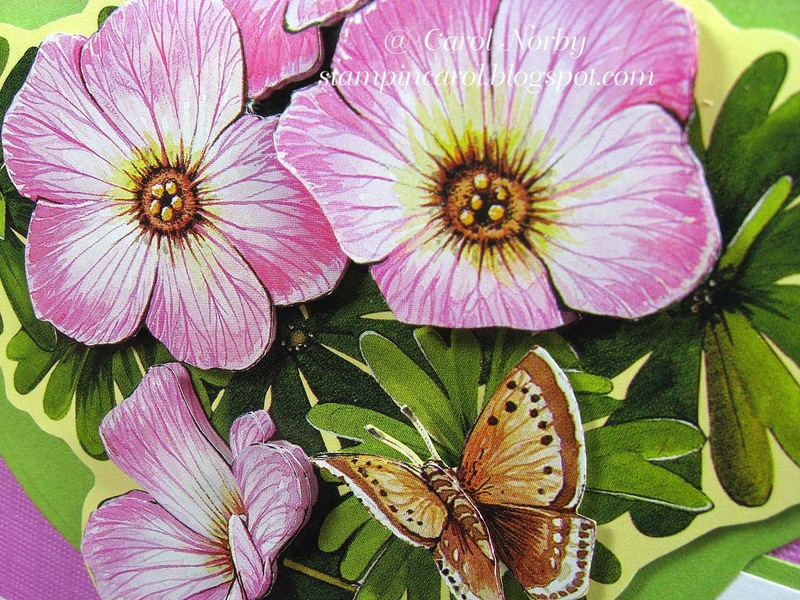 I added some bling with the Stardust Clear Gel pan on the flower centers and butterfly wings. 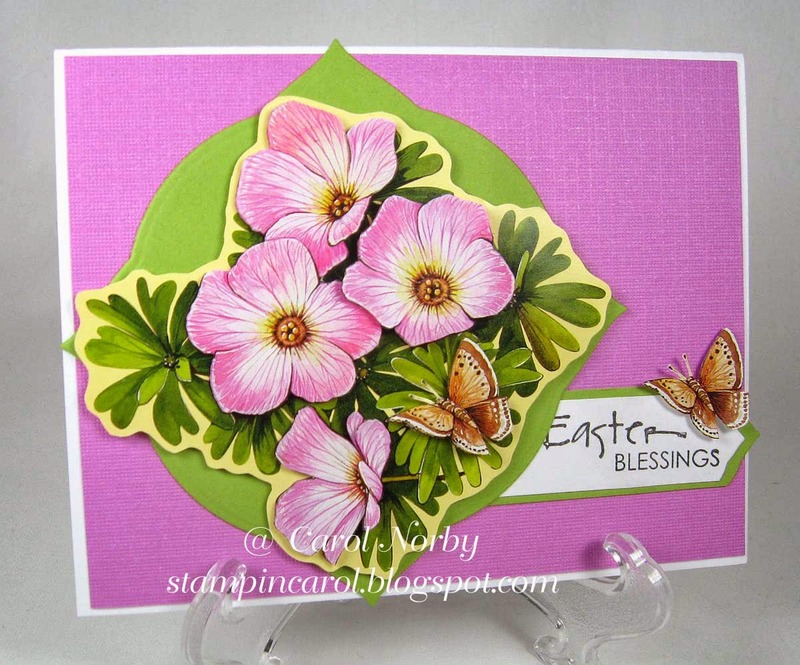 The stamped image is from an old TAC stamp set. I have just finished a Christmas card and have cut out 3 other sets of images. I have 2 more to complete. Needless to say, no cleaning is getting accomplished. Isn't it wonderful when you find something that you didn't even know was missing! I remember the 'good ol' days of huge conventions, you could find all sorts of stuff at those! The purge continues, hoping to get the cabinet up here this weekend, go through all the stuff (again) and decide what stays and what goes. I can't wait to get creating again!!! !